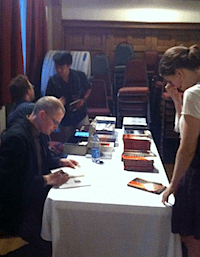 What a rare and inspiring privilege it was to be with poet and author Christian Wiman last week. I for one am still reeling–don’t know how it could have possibly been any richer. Thankfully, like his poetry in Every Riven Thing and his prose in My Bright Abyss, the talks he gave here in Charlottesville defy distillation. They require real attention–and while one might expect as much from an artist of his caliber and quality, still, the anticipation of poetic brilliance doesn’t make it any less arresting when you actually experience it. P.S. Keep an eye out in the coming weeks for an exclusive interview with the man himself. P.P.S. Why would God care about England?! Ha. This visit with Christian Wiman was indeed a reverberating gift. Thanks so much for all the work and care that Mockingbird gave over to make it happen. So blessed.